I just had the best summer I have ever had with all four of my kids! We traveled, all slept in (for the first time ever), swam in the pool, sat on the couch without feeling guilty; that I should be doing something else, crafted, tried yoga, attended circus school, read lots, watched movies, played games, and did whatever we wanted whenever we wanted, with little fighting. I know, I was surprised too! However, this was also the first summer that naps weren't needed, bedtimes could be lenient without horrible repercussions, and everyone just went with the flow and enjoyed being in the moment. 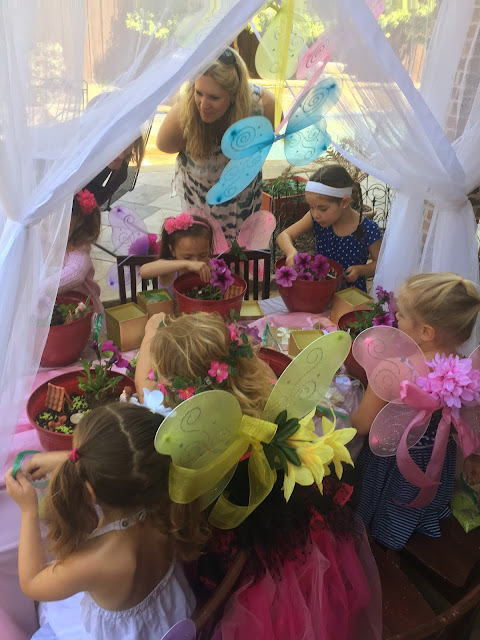 I realized that without all the hustle and bustle of school, homework, activities, room mom duties, and the constant "go go go" I was able to slow down and enjoy my kids again without being so stressed and irritable. And surprise, when I was happier, so were my kids! However, this was also the first time ever that I have completely forgot to make a hair appointment. As in I didn't notice or care how bad my roots were and how fried the ends were after months of swimming and sun. I looked in the mirror and all I could think about was a meme I came across a few years ago.."I've learned a lot about myself since becoming a mom. I didn't realize just how far I could let myself go and still be okay with it". While I laughed at this, there is also a sad slice of truth to it. I still carry around baby weight I gained from my first set of twins almost NINE years ago.Ugh, that's hard to say out loud. And don't get me wrong, I have tired to loose it but it has been hard with four young kids, the stress associated with a husband who commuted out of state for work twice, followed by two big moves for our family. Those may sound like excuses but that was my life, and for me, it was a very stressful time. So naturally when my to do list for the day was a mile long and I was exhausted, the workouts were the first thing to go. It may have taken awhile, but earlier this year I finally realized the time to get fit and healthy again is now. Not only do I want to feel better about myself again but I want to grow old with my husband and see my kids grow up. I started making better food choices, cutting back on wine (that's a hard one! ), and realizing there is no reason I can't workout for 30 minutes most days. We also adopted our two year old Border Collie/Husky mix named Baloo who needs to walk daily. That's the secret folks, go out and adopt a dog from your local shelter, start walking daily and boom...ten pounds gone! After that great start to my new routine came a busy end of school year and a month long vacation to visit our families and friends. After that, the summer of fun and relaxation continued until that day not long ago when I looked in the mirror. Since then I told myself it's time to get back on track and take care of yourself. The first thing I did was make a hair appointment! Hallelujah its scheduled for this weekend! I also tossed in a pedicure last weekend just because. I've restocked my vitamins, switched my afternoon cup of coffee to tea, made time to read and go to bed earlier when I need it, pray/meditate, eat more fruit and vegtables, meal plan, resume blogging because it's a creative outlet I enjoy, got an actual pair of nice pajamas instead of my old grubby sweats (I was surprised at how much better I felt), started doing face masks again, and working out. Walking the dog, riding bikes with my family, swimming, and going to the YMCA consistently again are giving me new muscle aches and more energy. Last but not least is my favorite. Yoga. Prior to kids I loved yoga and pilates and would take both classes back to back. When life got crazy, I knew I needed yoga back in my life. I slowly started doing some poses and breathing at home and couldn't believe what a difference it made. Then I found a yin yoga class and was in love. It's grounded, slow moving, and helps stretch your muscles. Plus you can totally be a newbie or out of the yoga practice for awhile and no one will notice or care. It's relaxing and I'm hoping this will help me slowly start to regain some of my flexibility. I might have jumped the gun but I decided to join a vinessya yoga class early this week. Well here's how that went. I was the heaviest and most unflexible person in that room. I yearned for my old body the whole time, the one that could actually do these poses. I spent lots of time staring at the instructor who was twisted up like a pretzel and whispered "wtf" while thinking I can't even come close to bending that way. BUT...I was proud of myself because I stayed the whole class and I gave it my all. Making permanent changes is all about taking small steps and never giving up. And life is all about balance. So take care of yourself mommas and no matter what your challenge is, don't give up!! Oh and I plan on going back to that yoga class..one of these days I will be able to bend like that. 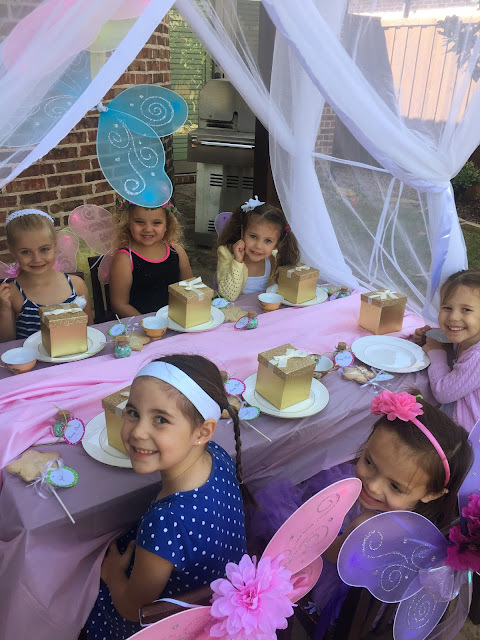 The idea for this party had been brewing for a couple years, but life with two sets of twins and two major moves in two and a half years put it on hold. 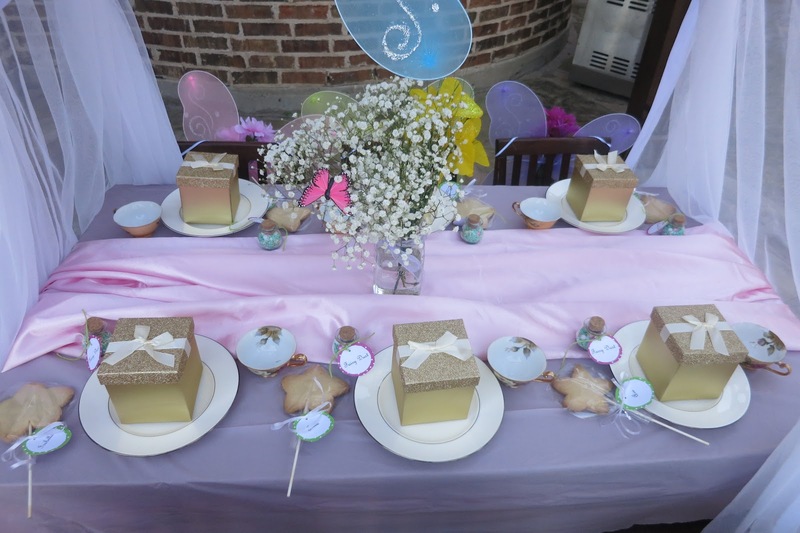 However, I am glad we waited because the party turned out to be everything I had hoped it would be! My grandmother's gold, pink, and green tea cups were the inspiration for this party. 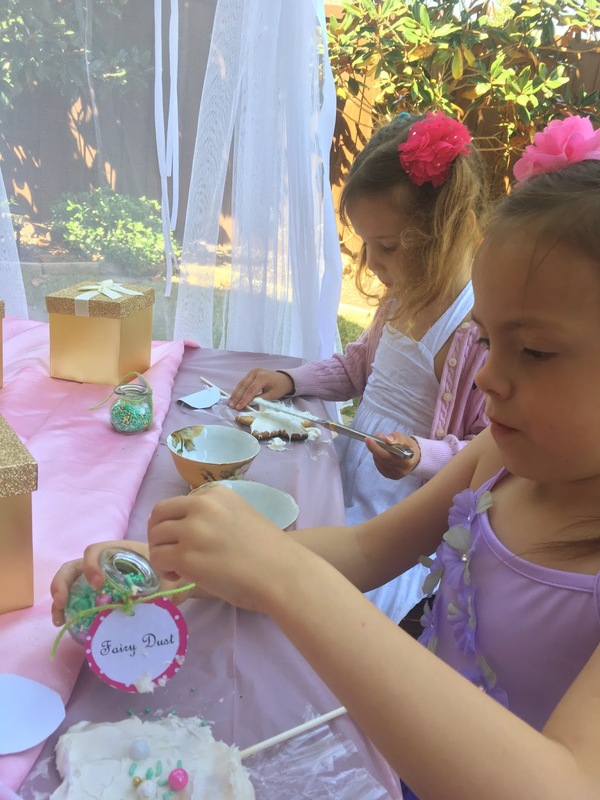 I wanted the girls to experience a fancy tea party with a whimsical touch. 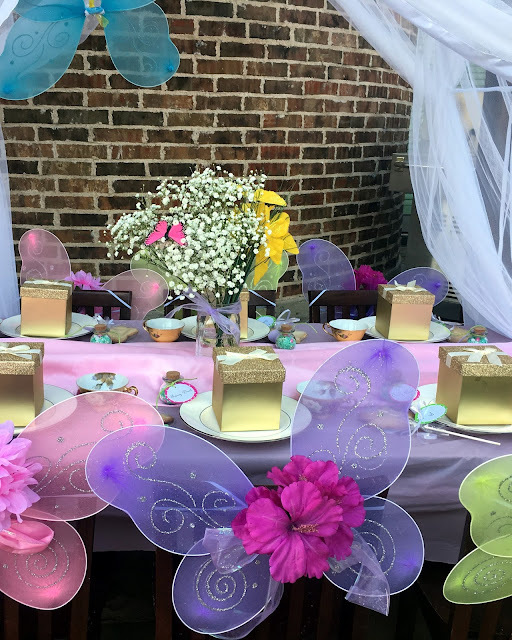 Each girl received a pair of fairy wings from Dollar Tree that I spruced up with fake flowers and ribbon also from there. At each girl's place setting was a fairy wand or star shaped sugar cookie on a stick. I picked up the Wilton sticks at the craft store and cut out thick star shaped cookies to slide on before baking. Next to the fairy wands were magical fairy dust aka fancy sprinkles. After lunch the girls frosted and decorated their wands and enjoyed! 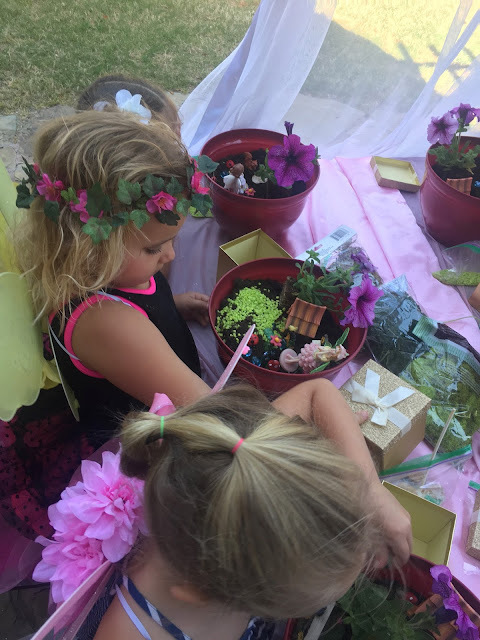 Inside the gold boxes (also from Dollar Tree) were the supplies the girls needed for their fairy gardens. 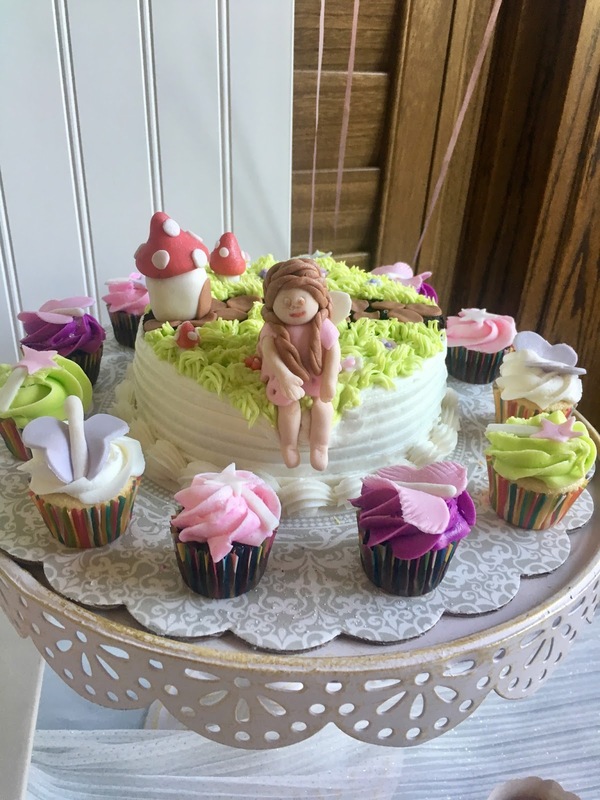 A fairy house, small animals, rocks, twigs, stones, benches, steeping stones, and a fairy. 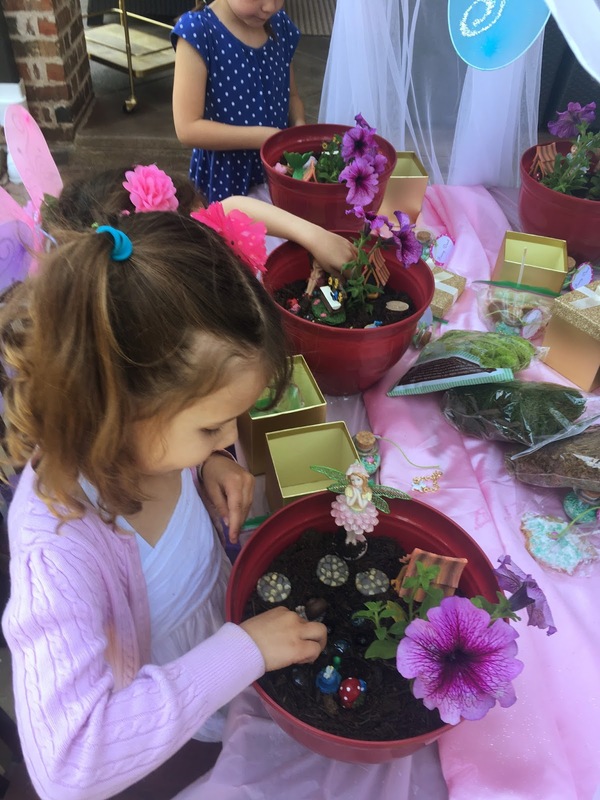 Home Depot, Dollar Tree, JoAnn Fabrics, and Hobby Lobby are where we found our fairy garden supplies. 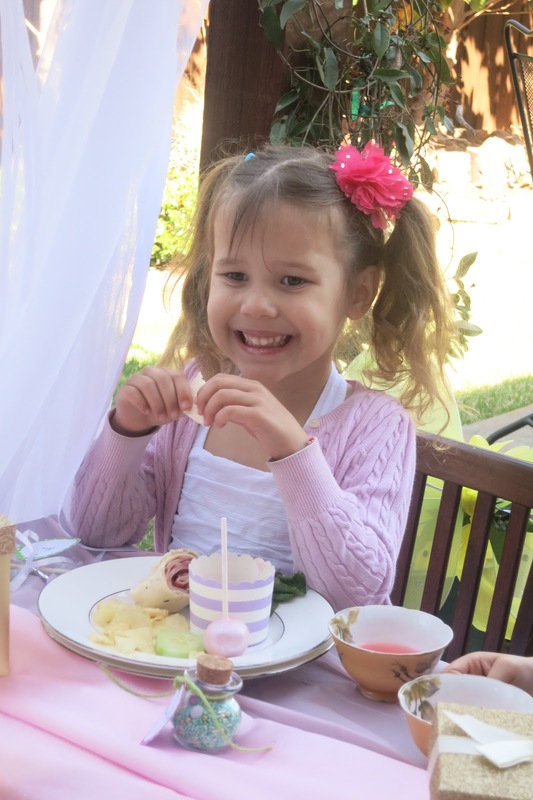 On the menu was iced tea or pink lemonade, ham and Swiss cheese pinwheels, fruit, chips, and veggies. I also had my mother in law's famous avgolemono soup, stuffed peppers, and salad available for the moms to enjoy. Due to strong winds, and the third outdoor party in a row I've had where the winds were 20-30mph, I decided to move the food table inside the house. It wasn't what I had envisioned but at least we avoided any potential disasters. 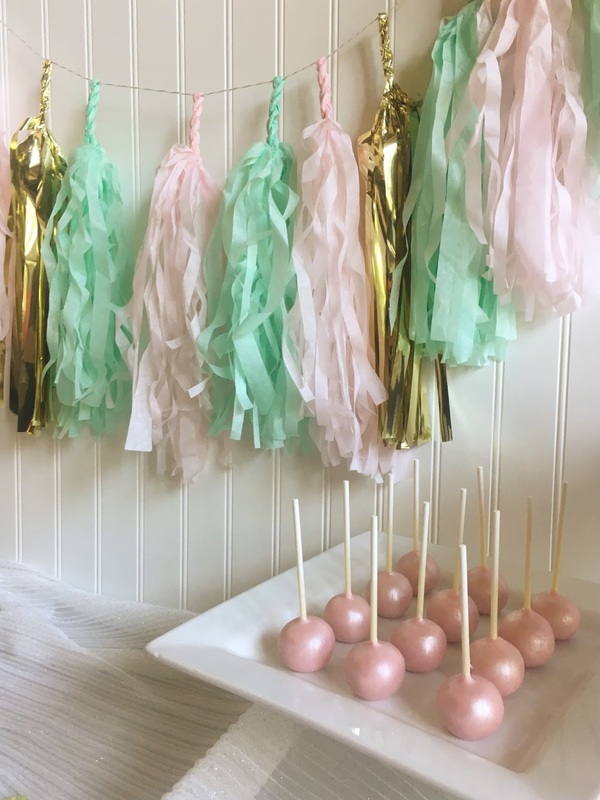 These shimmery cake pops tasted as good as they look! 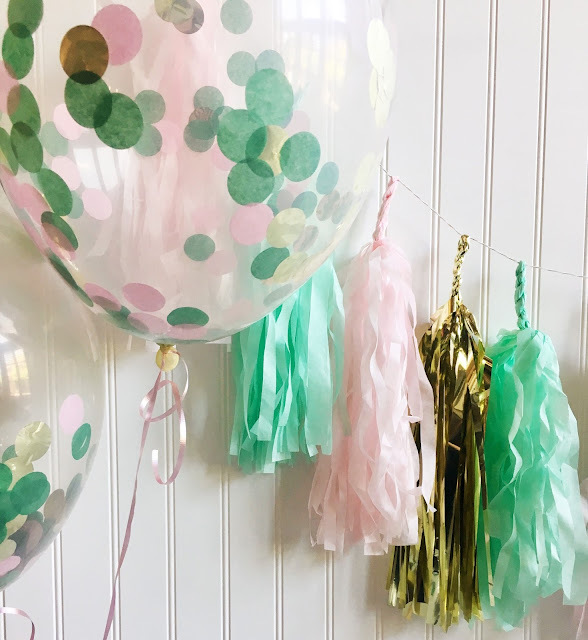 I just love these confetti balloons! After the tea party it was time to make our fairy gardens! The girls said this was their favorite part. 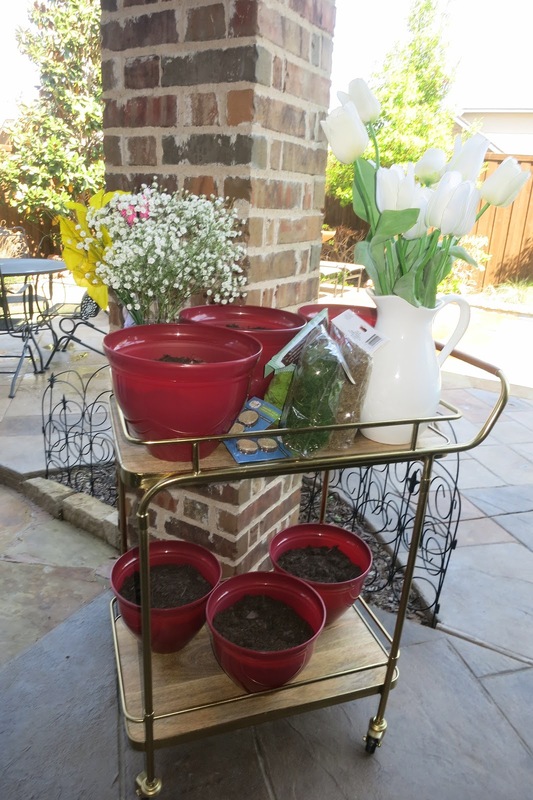 I also found the planters at Dollar Tree and filled them with dirt so the girls just needed to plant their flowers and decorate. Last year I didn't get to have my usual Halloween fun because our house was on the market and life was extra crazy getting ready for our move. This year, I made up for it! 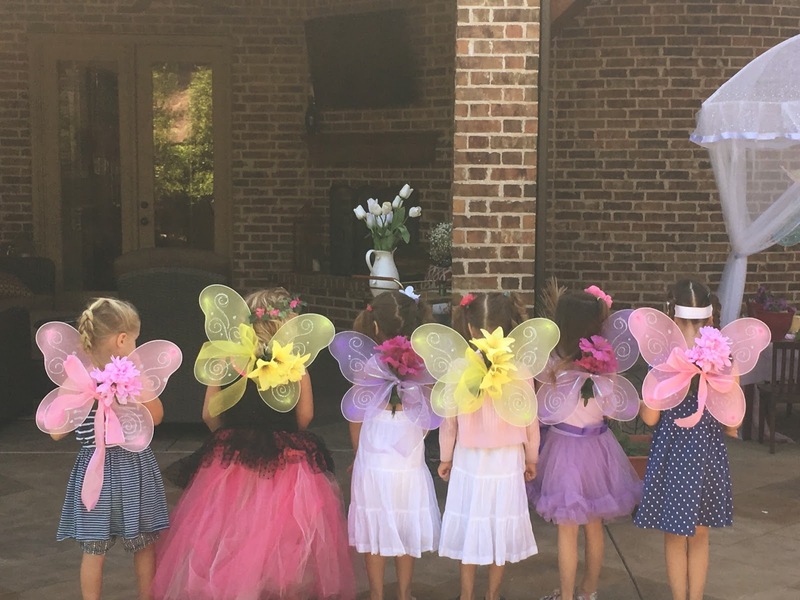 The house was crawling with spiders and bats, gravestones covered the front yard, our skeletons were up to their usual antics and the month was full of pumpkin patches and Halloween parties! One of the Halloween parties I threw was for the neighborhood kids and their families. While I love our new neighborhood we haven't found many kids similar in age to ours outside running around like we are used to. I assume this is because there is a good mix of young and old children as well as many "busy" families. Therefore, about 48hrs before our planned party of three families, I decided to invite the whole neighborhood! I panicked for a minute but as I suspected I received many thank yous but we have sports practice etc. However, we did have many families stop by who we got to meet for the first time! Since this was more of an open house party, I put out a vegetable and fruit tray, donuts, cupcakes, and scary popcorn. Sugar overload I know, but c'mon it is a Halloween party! For beverages there was bottled water, mummy juice boxes, and apple cider. A local donut shop made these. They didn't turn out like I had hoped, but the kids thought they were awesome and that's what counts! 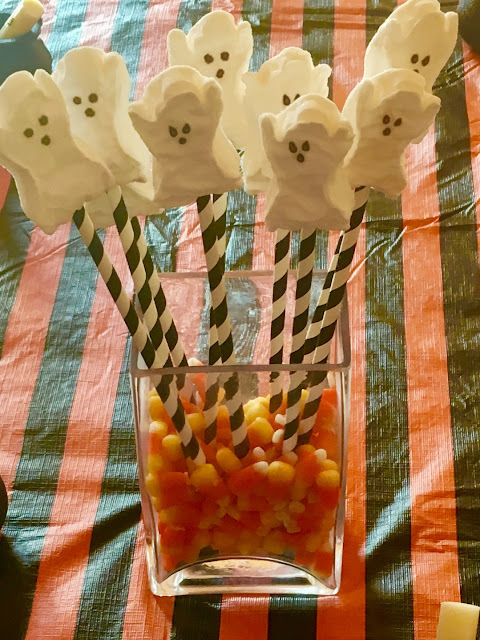 Halloween Popcorn is easy and fun! 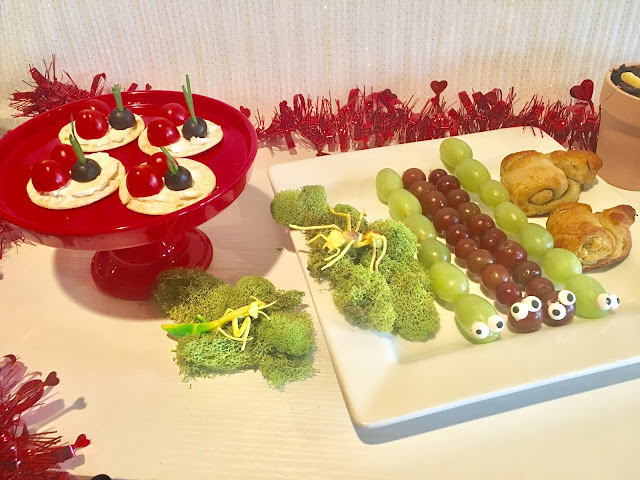 Eyeballs and gummy worms this time! 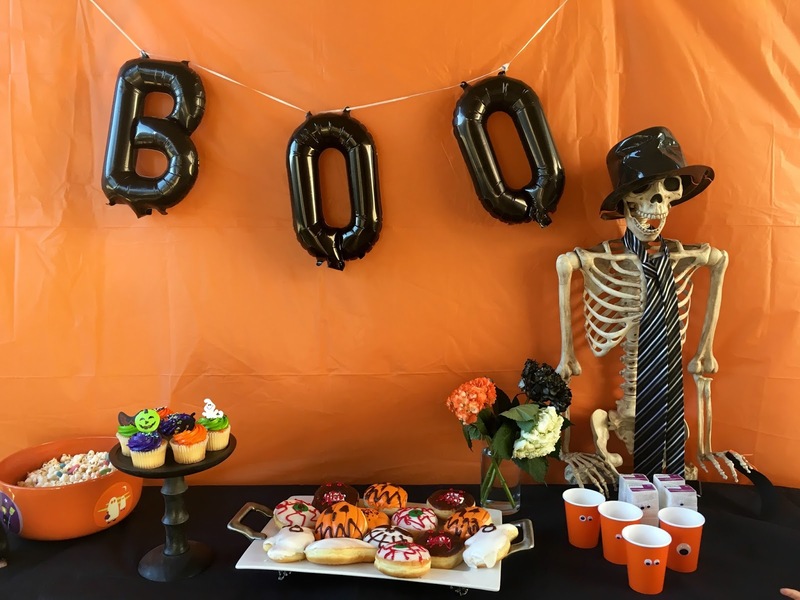 Mr. Bones did an amazing job tending the food and drink table considering the high winds that ONLY kicked up after I set up outside and the 88 degree heat that killed our Halloween hydrangeas in less than thirty minutes. BREATHE MJ.....again the wind?! Well part of party planning is dealing with unexpected issues and figuring out how to overcome them. In my case, lots of Duct tape and a glass of wine solved the problem this time! After everyone had a chance to meet and talk I had a few games planned for the kids. The first one was a Halloween scavenger hunt on our street. Since the kids varied in age from four to ten I had them all work together, and I have to say for a group of kids that pretty much just met, they worked very well together! The last part of the scavenger hunt ended with a silly string war that produced lots of laughs! Note to self: never again let my kids play around with my camera. Half of my pictures from this party got deleted! I apologize for the quality of the pictures since most of these were taken with my phone. 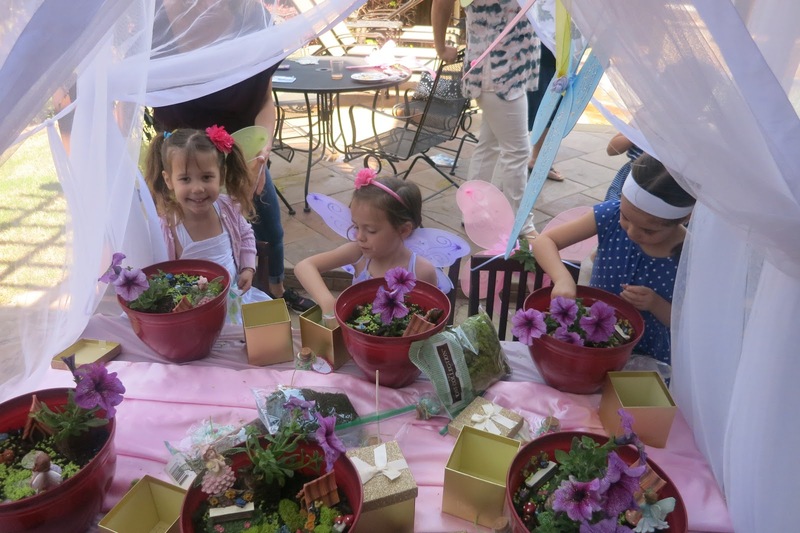 Once the scavenger hunt was complete, we headed back to our yard for a pinata filled with small prizes and candy. As many times as I think to myself that pinatas are over-rated the kids have so much fun with them! The last game I had planned was the saran wrap ball with candy inside, and yes, I think I gave more sugar out at this party than I allow my children to eat all year. I played Halloween music while the kids sat in a circle, put on winter gloves and unwrapped as much saran wrap as possible to find a treat before the music stopped and it got passed to the next person. If you are hosting any sort of party and need a good group game I suggest this one! A good friend gave me this idea when I was hosting my husbands company Christmas party and it was a hit! We wrapped up gift cards for the adults instead of candy though. If you have read any of my previous Halloween posts you know that Mr. Bones 1 and 2 (named by my eldest set of twins) are a set of 5ft. skeletons from Grandin Road. They have been appearing on the first of October the last few years and end up in some peculiar poses. They have greeted the boys off the school bus on the golf cart, have sat on the toilet while the other one is taking a shower, or even hid in their beds. In case you are wondering if this is another edition of Elf on the Shelf, relax, it's not! They move or travel throughout the month when momma feels like doing it to bring a smile to their face. And this year, with four kids who I enjoy entertaining, Mr. Bones 1 and 2 were quite busy. Enjoying the hot October weather or plotting their next move for Grandin Road's Halloween photo contest? Either way they ended up as a top three finalist in the contest! While they didn't win first prize, they had a lot of amazing friends voting for them daily and they did win $100! On Halloween Mr. Bones 1 rode shot gun to pick up the kids from school. While Mr. Bones 1 and 2 were busy having fun with the kids I attempted some Halloween bento lunches. No, I do not do these on a regular basis because this mom doesn't have that much extra free time but I try my best around the holidays because my kids enjoy discovering these creations. 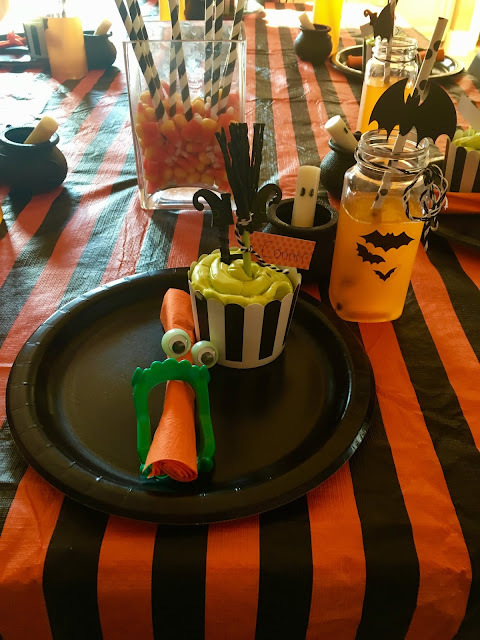 The other Halloween party I hosted that month was a small, but fun gathering with two great families we have met here. Moving someplace where you don't know a single soul is hard, thankfully these ladies and their sweet families have made it much easier! A Halloween themed dinner, fun adult beverage, a couple games, and great company was in store. Target Dollar Spot is the best! The kids each had a balloon tied to their ankle and they tried to keep their balloon safe while popping everyone else's balloon, last one standing was the winner! 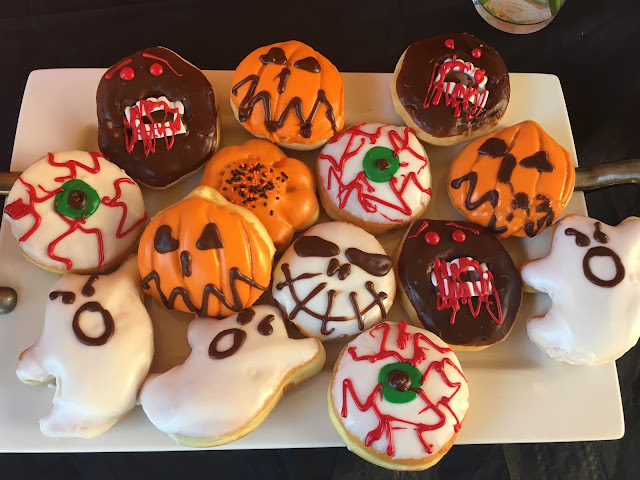 The second game I had planned was Halloween taste testing! The players were blindfolded and then had to guess be brave and try something while figuring out if it was an eyeball or an olive?! A witches fingernail or an almond silver?! When all was said and done, it was a busy and spooky month of Halloween fun! And you better believe I already have some ideas for next Halloween!! Thank you Target dollar spot for the goodies! 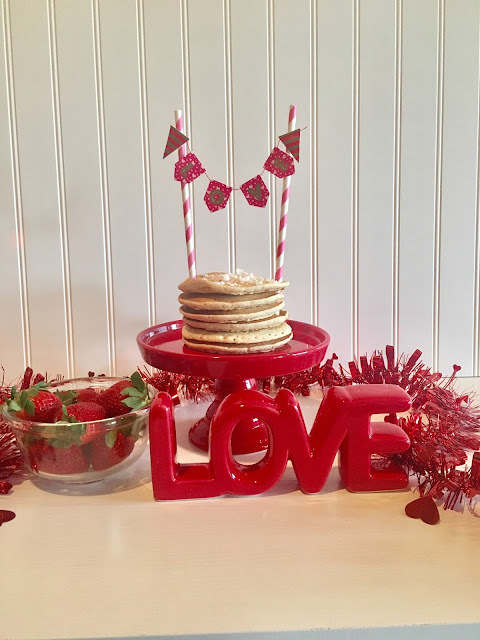 On Valentine's Day every year I make a traditional pancake breakfast for my four little love bugs! It's nothing fancy, but they love it. 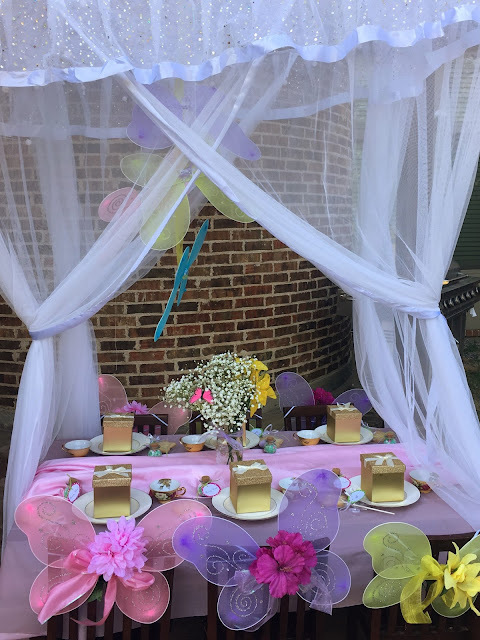 The table is decorated with hearts, balloons and a couple small gifts they receive from us and their grandparents. 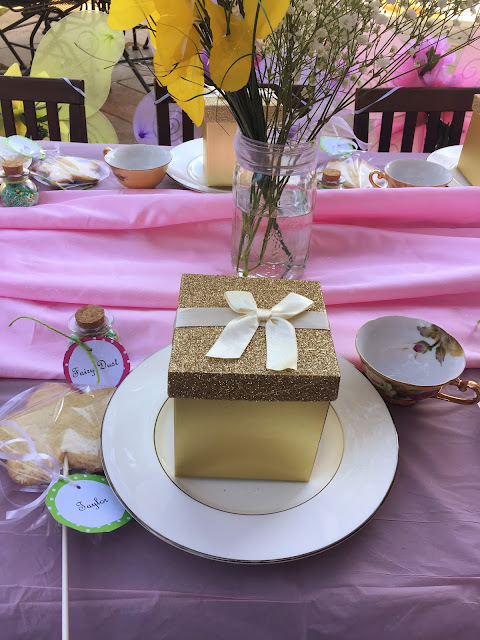 Check out the latest on my mom's blog whathappensatgrandmas for more of her Valentine craft and gift ideas! When my oldest set of twins (the boys) were about a year old my mom started calling them the "doodlebugs". They were a busy, bald headed pair of cuteness that loved to curl up in your lap and snuggle! My second set of twins, the "ladybugs" arrived four years later! 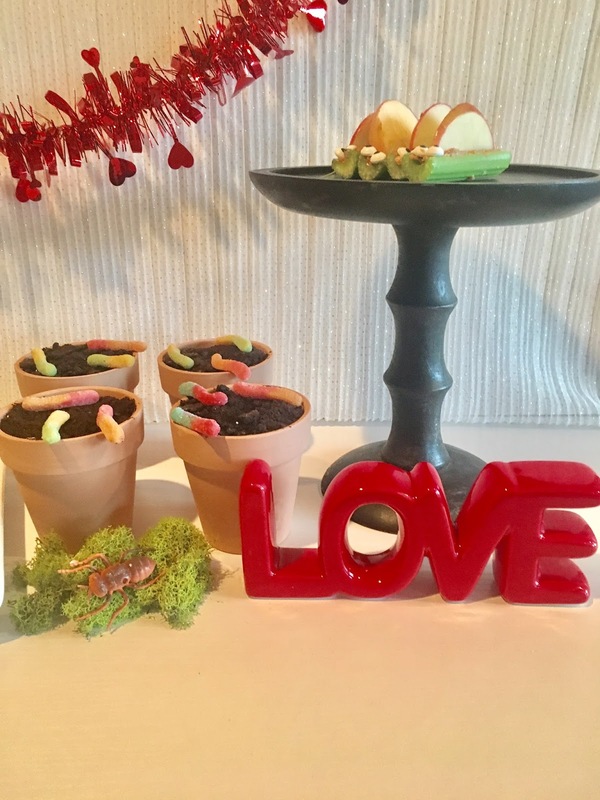 In honor of my little bugs I decided to have a Love Bug themed dinner this year. On the menu was homemade cheese pizza, ladybugs on crackers, grape worms, pesto snails, apple and celery insects, and dirt cups for dessert. All washed down with a tall glass of bug juice aka green healthy juice! Easy and fun. And of course hearing my son say how cute everything was and my daughter tell me everything is "just perfect" didn't hurt either. Or all the xoxo I got from my love bugs (big and small) that day! If you are looking for a budget friendly and easy Valentine idea, I've got one for you! 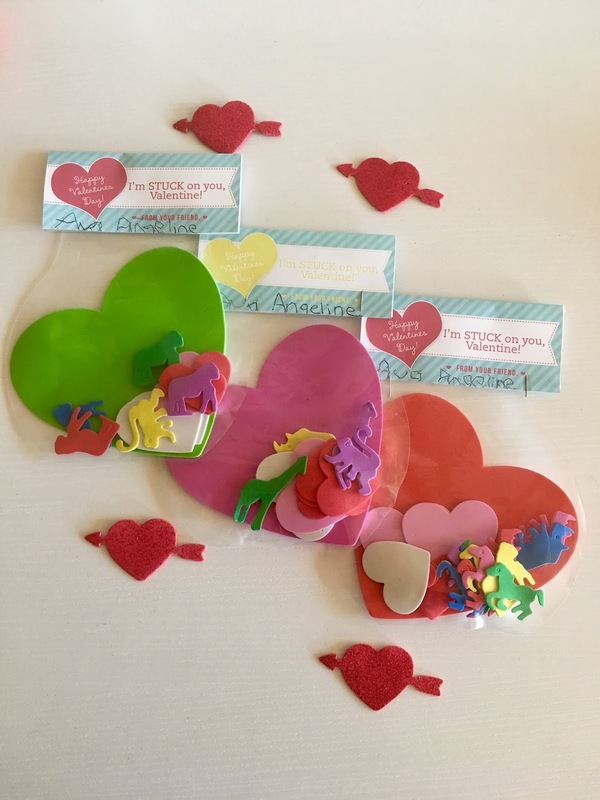 I saw these foam hearts and stickers at Dollar Tree last week and thought they would be perfect for my preschoolers' valentines since their classroom has severe food allergies. And while I am no stranger to using store bought valentines cards, I wanted to do something a little more this year. I already had the clear plastic baggies I purchased from Michael's craft store awhile back. Although you could use small clear zip lock baggies if you have them on hand. My plan was to create a cute printable that said "Let's stick together" but this busy momma of four and a new pup just doesn't have the time so I searched Pinterest and found this adorable "I'm stuck on you" printable for free from Rachael at The Cooke Family. The girls signed their names, a quick staple, and as my niece Kaylee would say done! done! I hope you have a Happy Valentines Day! !